The Glastron GTDW 225 Surf & Fish combines two wildly popular activities in a one-machine tour de force. Talk about forehead-slapping moments. When I first saw the Glastron GTDW 225 Surf & Fish at the Miami Boat Show, the concept of combining a surf-ready ski boat with a fishing boat suddenly seemed obvious, considering both are among boating’s most popular activities. Yet until Glastron introduced this model, anglers who had surf boats either had to buy a second boat or pound a square peg into a round hole by fishing on a boat ill-suited for the task. What makes the marriage of these two unlikely bedfellows possible is the Volvo Penta Forward Drive propulsion system, which tucks two forward-facing, counterrotating props beneath the hull. The setup keeps surfers who ride the everlasting wave right behind the boat out of the danger zone. Although the Glastron GTDW 225 Surf & Fish is designed for surfing, there’s no ballast option … yet. But the boat itself weighs a hefty 4,250 pounds, which is 300 pounds more than Cobalt’s slightly shorter CS23 surf boat (though the latter does carry additional ballast). The real ballast option is its ability to haul 13 people who can be strategically placed to further grow the wake. 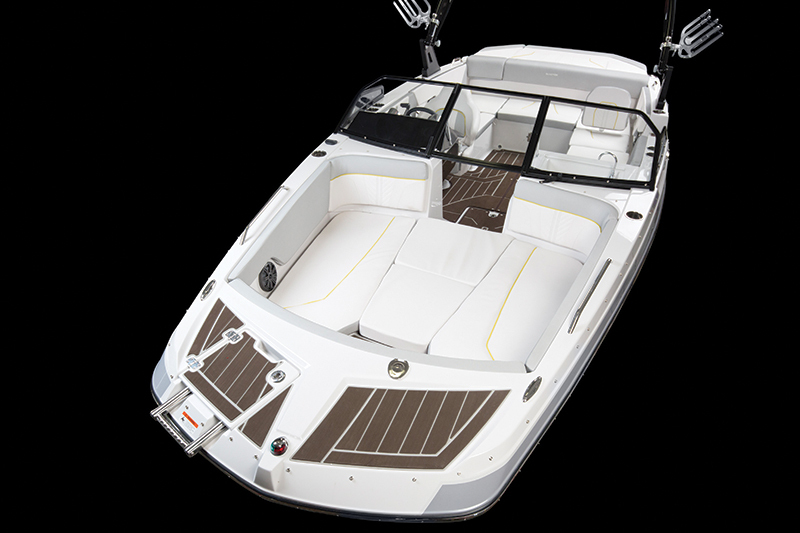 Another option to make the wake larger is to trim the Forward Drive, something that’s not possible on the more expensive Sea Ray SLX-W 230 surf machine, which uses a MerCruiser direct-drive Towsports Inboard for propulsion. This Glastron comes standard with Wake WorX Surf tabs. They use offset hinged blades to help grow and shape the wake, and they are capable of switching from left to right quickly with the help of Lenco Heavy Duty actuators. Unlike some other surf tabs, these are small enough to function as standard trim tabs and they don’t have speed limitations. The wake — not huge by dedicated surfboat standards — is well-formed, has a surprisingly large pocket and has the push needed to keep surfers riding as long as their legs and balance hold out. The cockpit can be accessed a couple of ways. One entrance is via a stern walkthrough that’s revealed by flipping up the starboard side of the large sunpad, which can also be propped up to form a backrest for lounging. The other is a portside amidships gunwale sectional that can be flipped up to effectively lower the gunwale height to make it easier to step over. And there’s a stepdown to make the transition down to the cockpit sole easier. 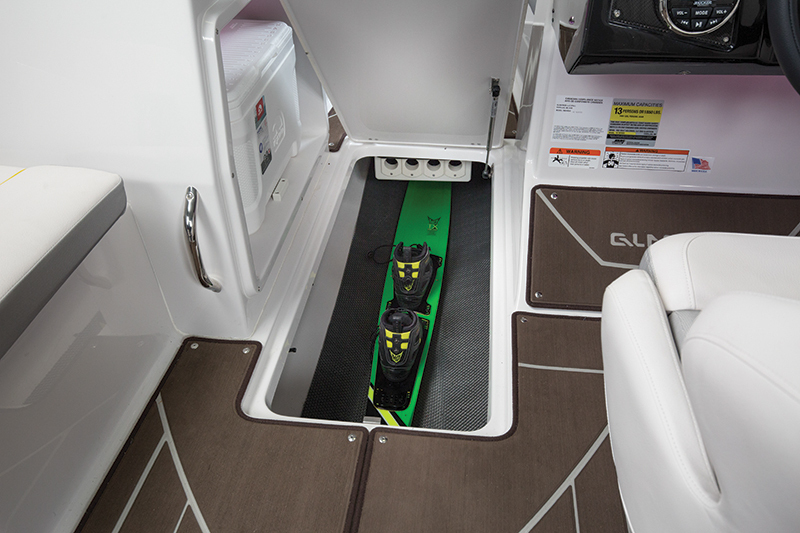 This bi-fold stepdown can be folded flat against the gunwale when not in use. A huge advantage the Volvo Penta Forward Drive system has over most surfboats’ direct-drive propulsion system is its outdrive’s ability to be trimmed, which reduces the hull’s wetted surface for less drag on plane and yields higher speeds. Glastron offers both the 240 hp and 280 hp iterations of Volvo’s new-gen, GM-based 4.3L V-6 aluminum-block motor that weighs a relatively light 908 pounds. Our boat had the 280 hp version, which, if the boat is used as intended, is a no-brainer option at a $3,334 premium. Without the Wake WorX tabs engaged, the Glastron GTDW 225 Surf & Fish got on plane in four seconds flat with minimal bowrise. Its time to 30 mph was 6.8 seconds under smooth, linear acceleration, which is ideal for skiing, and it reached a top speed of 48 mph. Contrast that with the Sea Ray SLX-W 230 — V-drive setup and 90 more hp — whose top speed was 41 mph. 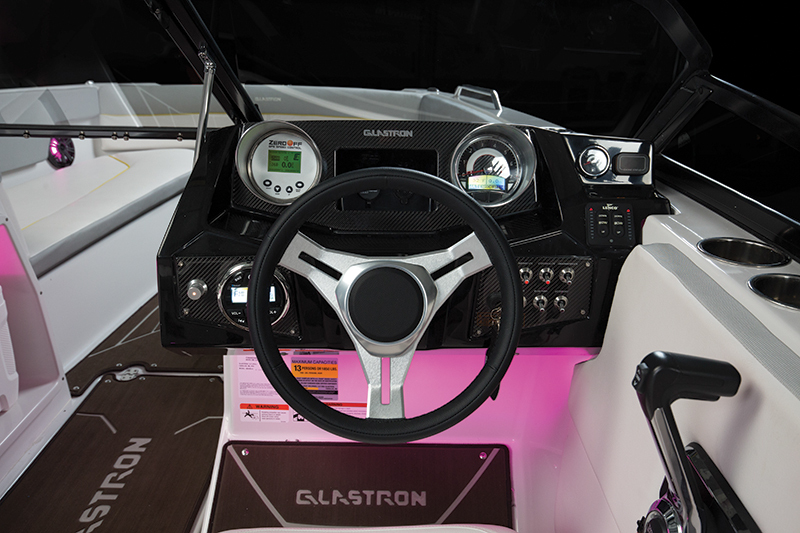 Glastron offers a 300 hp 5.3L V-8. Surprisingly, it weighs only 88 pounds more than the V-6 and comes at a reasonable upcharge of $2,466 over the 280 hp V-6. It should push the boat to the 50 mph range and provide a little more surfing ballast. 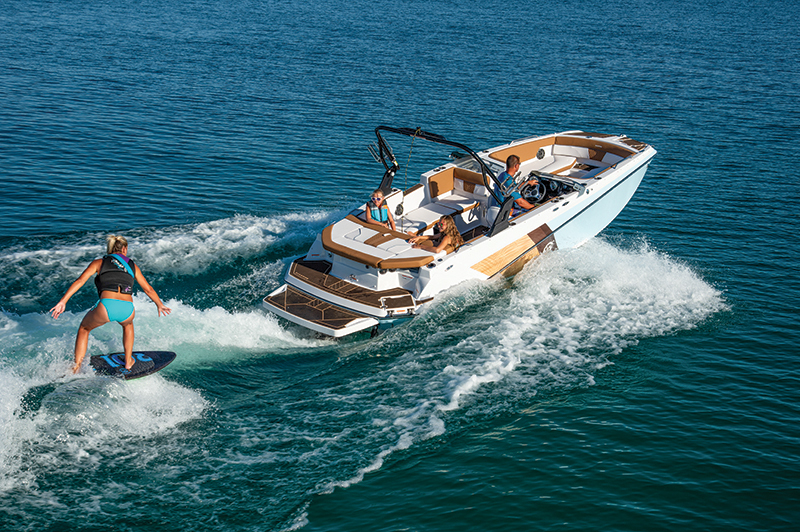 The Volvo Penta Forward Drive does more than deliver the ability to surf behind the boat. It also enhances the handling characteristics of the Glastron GTDW 225 Surf & Fish. Not only do the dual counter-rotating props cancel prop torque at low speeds and eliminate slow-speed wandering — a thorn in the side of drivers new to sterndrives — but the twin props deliver superior bite for better holeshot. But where the Forward Drive system really shines is during turns. 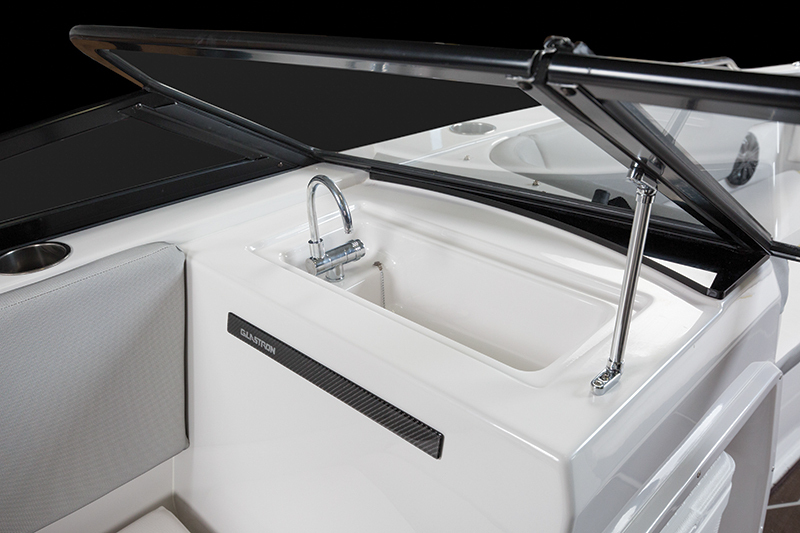 Because the props are placed farther forward, the boat’s pivot point is affected positively, allowing the driver to really whip the Glastron into hard turns that can be overcooked. Be careful. Its SSV hull has a moderate 17 degrees of deadrise, and extra-wide chines extend far forward to promote side-to-side stability. 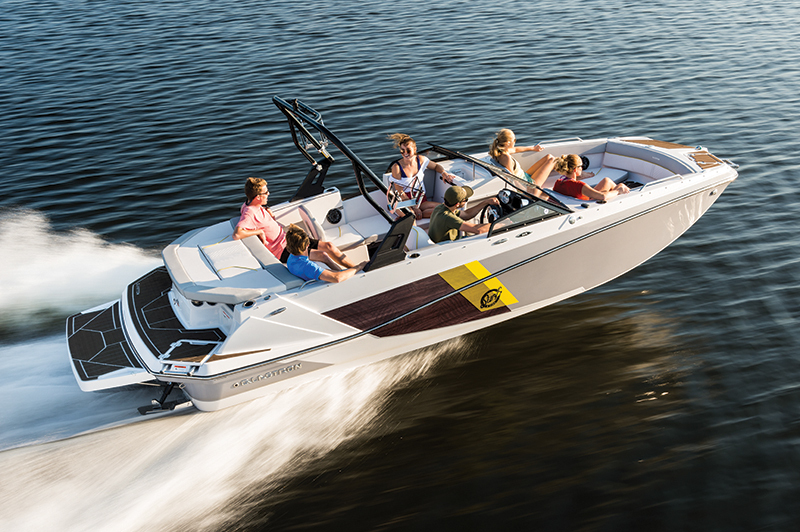 In addition to surfing, the Glastron GTDW 225 Surf & Fish makes a great wakeboard boat. At about 22 mph with both tabs deployed, it carved a clean ramp for boarders and tubers who want to catch a little air. The 225 is also a capable cruiser/entertainer thanks to a maximized seating arrangement that includes a U-lounge that stretches from the portside console all the way to the captain’s wraparound bucket. Up front are two chaise lounges with enough room for 6-foot-plus riders to stretch out, and there’s a step-up to a forward deck that has a boarding ladder for beach expeditions. The platform is based on Glastron’s GTD deckboat configuration, which carries much of its 8-foot, 6-inch beam far forward and includes plenty of room for fishing or lounging. 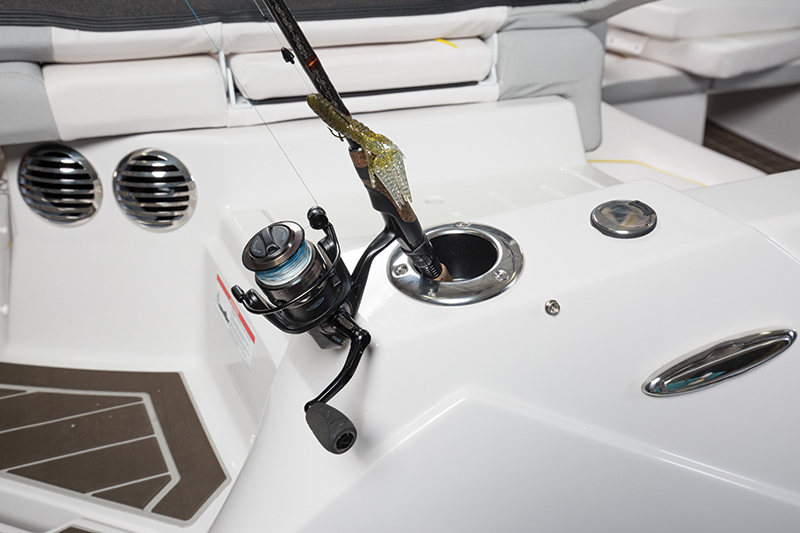 The Fishing Package ($2,067) includes a pair of upscale pedestal fishing seats owners can install on a Starboard casting platform up front and on the primary swim platform at the stern, a livewell, a trolling motor pre-rig and a mounting plate for 24v motors. And at the stern is a standard extended swim platform that sits low to the water and will be useful for landing a huge bass, getting in and out of the water, or as a place to chill and watch the sunset. A well-equipped boat that comes with a standard twin-axle trailer with quad disc brakes, the Glastron GTDW 225 Surf & Fish only needs a few options to maximize its usefulness. 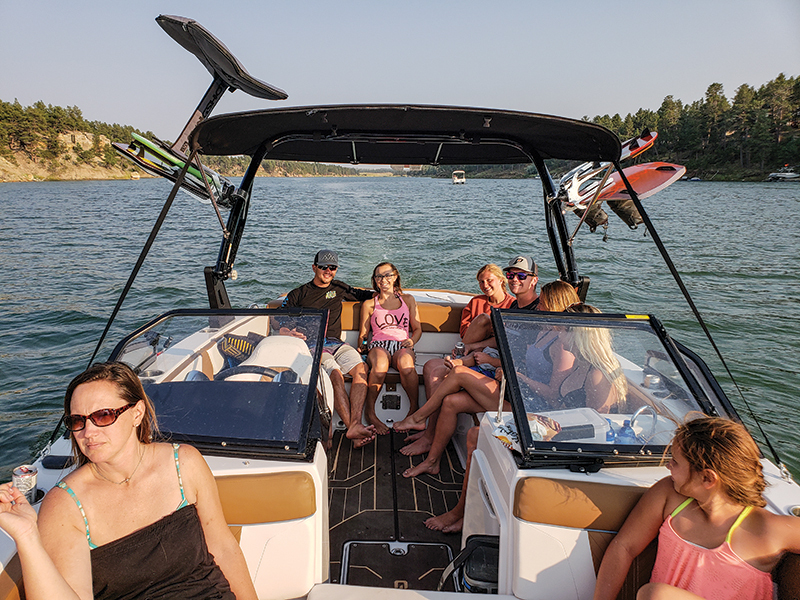 Watersports will be enhanced by Zero Off GPS-based cruise control ($1,731) and a gas-assisted drop-down tower that Glastron makes more affordable than most other towers ($1,967). Most options can be attained via package bundling, such as the XL Package ($1,653), which features Marine Mat in the cockpit, stainless steel grabrails and cupholders, pull-up cleats, a bow scuff plate, an hourmeter, a depthsounder and a water temperature gauge. Boosting the entertainment factor is easy with the Premium Sound Package ($1,273). It includes a stereo upgrade, a subwoofer, an aft remote and a lighting package. And there’s a cool bamboo cockpit table option ($627) that’s only $127 more than the boring, white rectangular model. This is one of the few ski boats with a windlass option, and it includes rode, chain and an anchor for $2,160. Purchased by Mike and Amy Rogers, Sturgis, S.D. Purchased at Recreation Station, Spearfish, S.D. We upgraded the stereo to an awesome Wet Sounds system and created a larger livewell under the stern bench. My family always had MasterCraft boats when I was growing up, and I was a competitive slalom skier. Then my parents got into sailing and I got out of boating for a while. Recently, my wife and I got back into boating with a Bayliner Bowrider, but we like to fish and realized we needed something more versatile. When we saw the Glastron GTDW 225 Surf & Fish, we were impressed by its roominess and its ability to multitask.. We love to go fishing for walleye in the morning then head back to the dock, remove the fishing seats and load the boat up with adults and kids — Peyton is 10 and Piper is 11 — and go surfing, tubing and skiing. The extended swim platform makes it really easy to get in and out of the water. Glastron’s customer service has been fantastic; we had a couple of issues and they really went the extra mile to make sure we were happy. Recreation Station’s service has been awesome and they also helped us customize the boat. LOA: 24 ft., 2 in. Dry Weight: (hull) 4,250 lbs. Time to Plane: 4.0 sec. Time to 30 mph: 6.8 sec.